Many chess players overestimate the value of talent and this damages their chess progress! Well, it’s really impossible if you think so. "Whether you think you can or can't, you're right" Henry Ford. In fact you definitely CAN achieve most of your chess goals (and probably even more). It’s just a matter of the right training. There is another funny thing which pupils often write me. It goes something like: “Hey, you are a talented person. Everything is simple for you. In my case it’s much more difficult”. Do you think I was born with a GM title? :) Of course not. Some time ago I was in the same situation as you: I tried to get better in chess, but didn’t know how to do it. There was a time, when I stuck without chess improvement for about 3-4 years (!!). I was training hard, but didn’t get any results. Heck, I even considered leaving chess. However, when I found and implemented the correct training methods, things got much better! I sped up my progress, won some tournaments and achieved the GM title. I just want to show you that your chess progress depends mostly on your training (not on your “talent”). A lot of my pupils got great results SUDDENLY for themselves! They didn’t expect these results and didn’t believe they could do it. 95% of players underestimate their chess abilities. Most probably You can achieve two times greater the results that you think. In order to prove this statement, I give you my other pupils’ feedback regularly. let me thank you again....and tell you about my first place in tournament on chess cube with 363 players! I mastered your last course: concept of tactics, correct moves etc.....You help us progress chess! Also I’ve added some new feedback here: Scroll down to read my pupils’ feedback. Your chess progress depends mostly on your training (not on your “talent”). Don’t set a limit to yourself! White: Kg4, Bd4, pawns: b2, f5. 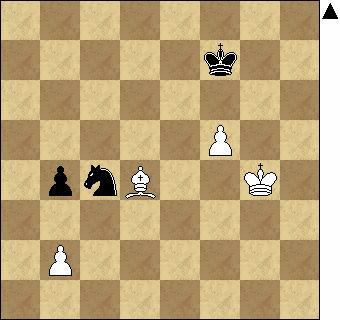 White has an obvious plan: to bring the king on the queen-side. How can black save the game? 1) Solve the chess puzzle.